The momentum of presidential candidate Pete Buttigieg’s campaign forced a Tuesday night town hall outdoors in Des Moines, Iowa, to accommodate a much larger than expected crowd. The campaign expected about 50 people for its town hall at the gymnasium at Benjamin Franklin Junior High school in Des Moines. The school estimated 1,650 people showed up. Buttigeig spoke briefly and for the second time Tuesday answered questions from the crowd. During his brief remarks, he mentioned that Electoral College should be abolished, saying that whoever gets the most votes should be elected to office. Should that have been the case in 2016, Democrat Hillary Clinton outpaced Donald Trump in the popular vote. 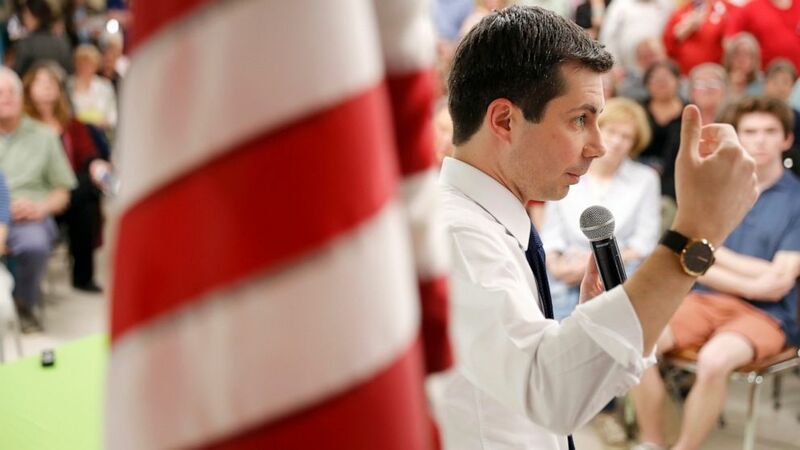 (AP Photo/Charlie Neibergall) 2020 Democratic presidential candidate South Bend Mayor Pete Buttigieg speaks during a town hall meeting, Tuesday, April 16, 2019, in Fort Dodge, Iowa. 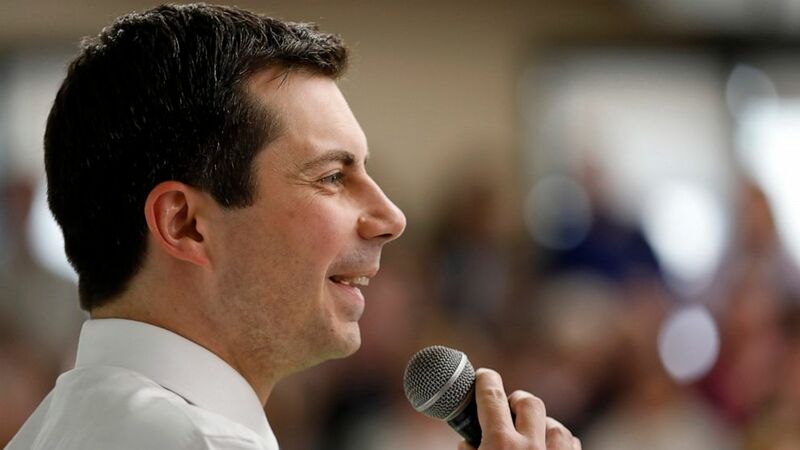 Buttigieg, who is gay, spent a portion of the question and answer session addressing the issue, which has come into further focus after an interview on “Ellen” and trading jabs with former Indiana Gov. Mike Pence. “Good question. First, tell your friends, I say, ‘Hi.’ Tell them about Indiana in 2015,” he said. The candidate also returned to an ongoing back-and-forth with now-Vice President Pence, who was booed when mentioned. “You know my differences with the vice president,” he deadpanned. 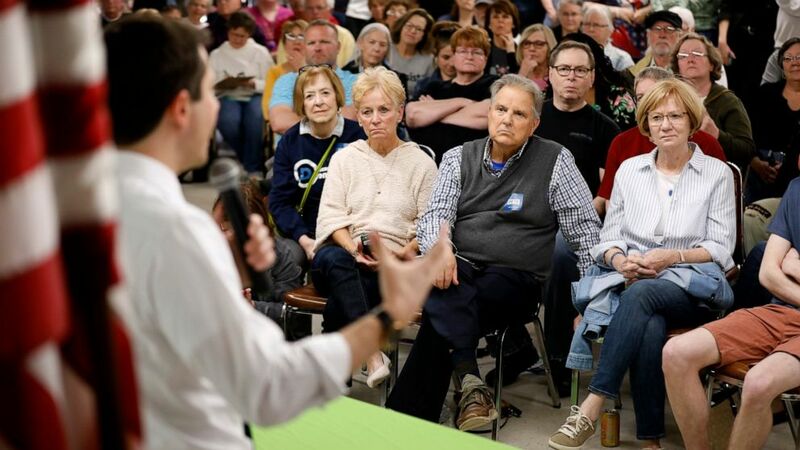 (AP Photo/Charlie Neibergall) Audience members listen as 2020 Democratic presidential candidate South Bend Mayor Pete Buttigieg speaks during a town hall meeting, Tuesday, April 16, 2019, in Fort Dodge, Iowa. 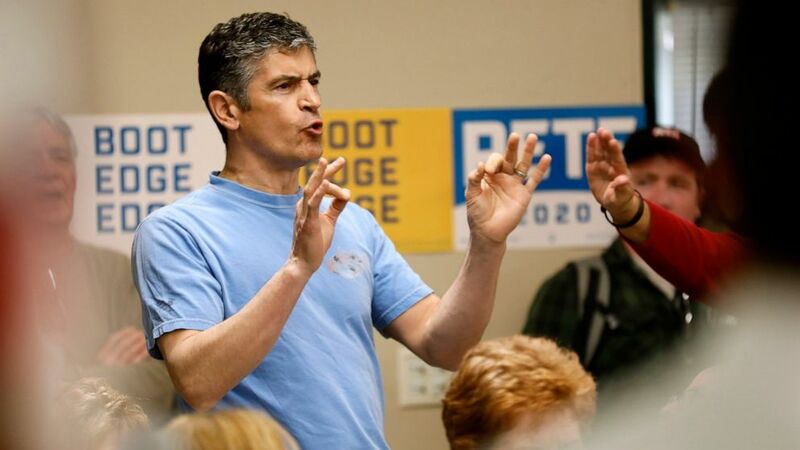 For the second time in one day, Buttigieg was interrupted by a protester — both in Des Moines and earlier in the day in Fort Dodge. Lis Smith, a communications adviser to the mayor who was asked by members of the press whether they have security at events, said that they have had to hire security. Buttigieg was asked about a smattering of other topics as well. “He’s kind of like a Chinese finger trap: The harder you pull the more you get stuck. It’s important to think about strategy,” he said. Buttigieg told the crowd that the National Rifle Association has struck fear in politicians because they mobilize people and that the anti-gun movement should, too. A man named Scott submitted a question asking whether Buttigieg had changed his opinion from anything he wrote in his book. “I guess I changed my mind about running for president,” he said. “I had thought about it. “Where’s Scott? Hey Scott! Thanks for reading the book! The book is how we’re paying off the wedding!” he said to laughs. When finishing up his answer to the final question, Buttigieg told the crowd, “sounds like my time is up.” The crowd groaned and someone yelled “Four more years!” The mayor laughed and said, “But I’ll be back,” and asked for the crowd’s support. Buttigieg and his husband spent about 45 minutes shaking hands and talking to members of the crowd after the Q and A.
ABC News’ Mark Osborne contributed to this report.